The ADDiva travel cosmetic bag is the perfect size for brushes, makeup, lipsticks, toothbrush and paste OR use it at home to organize your bathroom. Small size measures 9 x 7 inches. 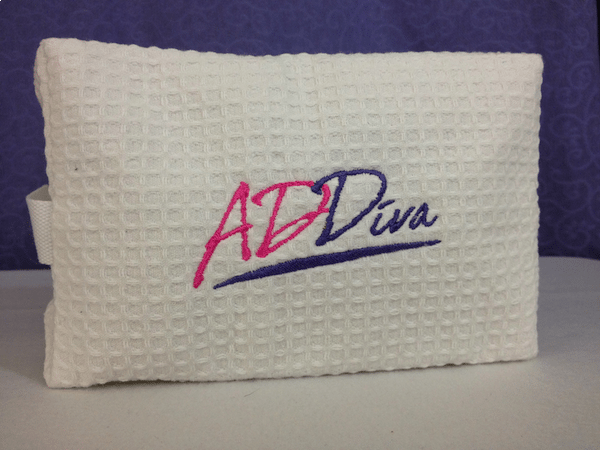 Perfect for travel, the ADDiva cosmetic bag is made of 100% cotton waffle weave to match your ADDiva robe. Lined with an inside pocket and two grab tabs on each end, this handy little bag will be your constant companion. Machine wash, cold, line dry. Size: 9 in wide, 7 inches high.